x1. Mccormac LJ, Cauldwell EW, Anson BJ (1953) Brachial and ante brachial arterial patterns- A study of 750 extremities. Surg Gynecol Obst 96: 43-54.
x2. Rodrigue NM, Vazquez T, Nearn L, Ferreira B, Parkin I, et al. (2001) Variations of the arterial pattern in the upper limb revisited: a morphological and statistical study, with a review of the literature. J Anat 199: 547-66.
x3. Natsis K, Papadopoulou AL, Papathanasiou E, Noussios G, Paraskeva G, et al. (2009) Study of two cases of high-origin radial artery in humans. Eur J Anat 2: 97-103.
x4. Natsis K, Papadopoulou AL, Paraskevas G, Totlis T, Tsikaras P (2006) High origin of a superficial ulnar artery arising from the axillary artery: anatomy, embryology, clinical significance and a review of the literature. Folia Morphol 65: 400-5.
x5. Hee-jun Y, Young-chun G, Hye-yeon L (2008) Variations of the superficial brachial artery in Korean cadavers. J Korean Med Sci 23: 884-7.
x6. Yokoyama N, Takeshita S, Ochiai M, Koyama Y, HoshinoS, et al. (2000) Anatomic variations of the radial artery in patients undergoing trans radial coronary intervention. Catheter Cardiovasc Interv 49: 357-62.
x7. Drizenko A, May nou C, Mestdagh, Mauroy B, Bailleul JP (2000) Variation of the radial artery in man. Surg Radiol Anat 22: 299-303.
x8. Bergman RA, Afifi AK, Miyauchi R (2015) Illustrated encyclopedia of human anatomic variation: Opus II: cardiovascular system: arteries: upper limb. x9. Wysiadecki G, Polguj M, Haładaj R, Topol M (2017) Low origin of the radial artery: a case study including a review of literature and proposal of an embryological explanation. Anat Sci Int 2: 293-8.
x10. Pelin C, Zagyapan R, Mas N, Karabay G (2006) An unusual course of the radial artery. Folia Morphol 65: 410-3.
x11. Rolfe B (2016) Gray’s Anatomy- The Anatomical Basis of Clinical Practice (41st Edn) Elsevier, Churchill- Livingstone Publ 776-1030.
x12. Valsecchi O, Vassileva A, Musumeci G, Rossini R, Tespilim M, et al. (2006) Failure of transradial approach during coronary interventions: anatomic considerations. Catheter Cardiovasc Interv 67: 870-8.
x13. 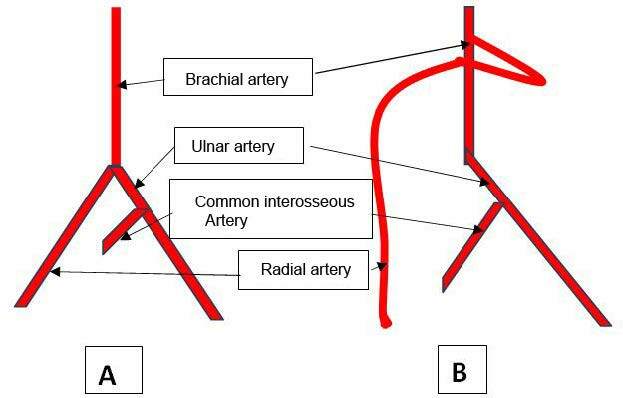 Shetty SD, Nayak BS, Venu Madhav N, Srinivasa RS, Abhinitha P (2012) The Abnormal Origin, Course and the Distribution of the Arteries of the Upper Limb: A Case Report. J Clin Diagn Res 6: 1414-6.
x14. Singh R, Malhotra R, Wadhawan M (2017) Anomalies of radial and ulnar arteries. J Vasc Bras 16: 56-9.
x15. Patnaik VVG, Kalsey G, Singla RK (2001) Bifurcation of axillary artery in its 3rd part a case report J Anat Soc India 50: 166-9.
x16. Rodrigue-Niedenfuhr M, Burton GJ, Deu J, Sanudo JR (2001) Development of the arterial pattern in the upper limb of staged human embryos: normal development and anatomic variations. J Anat 199: 407-17.
x17. Waghmare JE, Tarnekar AM, Sonatakke BR, Bokariya P, Ingole IV (2009) A high origin of radial artery with asymmetrical vasculature of upper limbs: a case report. Nepal Med Coll J 4: 284-6.
x18. Taheri MMH, Abdi R (2013) A case report of high origin superficial ulnar artery, its embryological background and clinical significance. Int J Anat Variat 6: 184-7.
x19. Kumka M, Pukiss S (2015) A rare case of unilateral variations of forearm arteries: anatomy, embryology and clinical implications. J Can Chiropr Assoc 59: 253-60.
x20. McWilliams RG, Sodha I (2000) Doppler ultrasound of a superficial ulnar artery. Eur J Ultrasound 13:155-7.
x21. Zheng Y, Shao L, Mao JY (2014) Bilaterally symmetrical congenital absence of radial artery: a case report. BMC Surg 14: 15.
x22. Gaudino M, Crea F, Cammertoni F, Mazza A, Toesca A, et al. (2014) Technical Issues in the Use of the Radial Artery as a Coronary Artery Bypass Conduit. ann thor surg 98: 2247-54.
x23. Gourassas J, Usama A, Christodoulos E. Papadopoulos (2003) A. nomalous Origin of Right Radial Artery as a Cause of Radial Approach Failure of Coronary Angiography. Hellenic J Cardiol 44: 226-9.
x24. Sandhu K, Butler R, Nolan J (2017) Expert Opinion: Transradial Coronary Artery Procedures: Tips for Success. Interv Cardiol 12: 18-24. 1. Mccormac LJ, Cauldwell EW, Anson BJ (1953) Brachial and ante brachial arterial patterns- A study of 750 extremities. Surg Gynecol Obst 96: 43-54. 2. Rodrigue NM, Vazquez T, Nearn L, Ferreira B, Parkin I, et al. (2001) Variations of the arterial pattern in the upper limb revisited: a morphological and statistical study, with a review of the literature. J Anat 199: 547-66. 3. Natsis K, Papadopoulou AL, Papathanasiou E, Noussios G, Paraskeva G, et al. (2009) Study of two cases of high-origin radial artery in humans. Eur J Anat 2: 97-103. 4. Natsis K, Papadopoulou AL, Paraskevas G, Totlis T, Tsikaras P (2006) High origin of a superficial ulnar artery arising from the axillary artery: anatomy, embryology, clinical significance and a review of the literature. Folia Morphol 65: 400-5. 5. Hee-jun Y, Young-chun G, Hye-yeon L (2008) Variations of the superficial brachial artery in Korean cadavers. J Korean Med Sci 23: 884-7. 6. Yokoyama N, Takeshita S, Ochiai M, Koyama Y, HoshinoS, et al. (2000) Anatomic variations of the radial artery in patients undergoing trans radial coronary intervention. Catheter Cardiovasc Interv 49: 357-62. 15. Patnaik VVG, Kalsey G, Singla RK (2001) Bifurcation of axillary artery in its 3rd part a case report J Anat Soc India 50: 166-9. 16. Rodrigue-Niedenfuhr M, Burton GJ, Deu J, Sanudo JR (2001) Development of the arterial pattern in the upper limb of staged human embryos: normal development and anatomic variations. J Anat 199: 407-17. 17. Waghmare JE, Tarnekar AM, Sonatakke BR, Bokariya P, Ingole IV (2009) A high origin of radial artery with asymmetrical vasculature of upper limbs: a case report. Nepal Med Coll J 4: 284-6. 22. Gaudino M, Crea F, Cammertoni F, Mazza A, Toesca A, et al. (2014) Technical Issues in the Use of the Radial Artery as a Coronary Artery Bypass Conduit. ann thor surg 98: 2247-54. 23. Gourassas J, Usama A, Christodoulos E. Papadopoulos (2003). A. nomalous Origin of Right Radial Artery as a Cause of Radial Approach Failure of Coronary Angiography. Hellenic J Cardiol 44: 226-9. 24. Sandhu K, Butler R, Nolan J (2017) Expert Opinion: Transradial Coronary Artery Procedures: Tips for Success. Interv Cardiol 12: 18-24. Copyright: © 2018 Ghosh A. This is an open-access article distributed under the terms of the Creative Commons Attribution License, which permits unrestricted use, distribution, and reproduction in any medium, provided the original author and source are credited. The variation of radial artery and its clinical significance had been studied multiple times and we present here another case of radial arterial variation. During routine dissection at gross anatomy lab, we have found a radial artery originated from the upper third of brachial artery and had a superficial course at the arm and proximal forearm in a 72- year- old Caucasian female cadaver. We have discussed the possible embryological explanation of this condition and related clinical implications. This kind of unusual origin and course of radial artery should be kept in mind by all healthcare providers during routine venipuncture, orthopedic and plastic surgeries of the arm, coronary angiographic procedures in radial approach to prevent unwanted complications. Radial artery, one of the most important arteries of upper limb, often has variable course [1-6]. Arterial variation is quite common in human body and variation of radial artery from its normal anatomical origin and course is the commonest among them [1,3,7]. The radial artery has immense clinical significance because of: frequent variation, frequent use as an arterial graft in surgery or as a route of angiographic procedures and infrequent use of upper limb arterial tree- angiogram preoperatively 3. Numerous researchers have studied, documented and classified the variation patterns of radial artery, still, new cases of variation are being studied and recorded [2,3,8,9]. Usually, radial artery originates as one of the terminal branches of the brachial artery within cubital fossa at the level of the neck of radius [1,3,10,11]. Radial artery of high origin usually arises from the proximal part of the brachial artery or less commonly from axillary artery [1,3,8,10]. High origin of radial artery has been reported in 20.3% cases in dissected cadaver and 8.3% in angiographic studies [2,12]. We are reporting here a unilateral case of radial artery of high origin arising from the upper third of brachial artery, having a superficial course over arm and cubital fossa and a normal course at distal forearm. The artery arose from the medial side of brachial artery, was tortuous throughout its course and crossed the brachial artery and median nerve immediately after its origin at arm - all of which made this case unique. Tortuous radial artery has been mentioned in literature very rarely [13,14]. We will discuss the possible embryological background of this anomaly and its clinical implication in details. We observed an unusual radial artery on right upper limb in a 72 years old Caucasian female cadaver during routine dissection at our gross anatomy lab. The left radial artery showed the usual origin and course. The anomalous radial artery took its origin from the medial side of brachial artery approximately 3 cm below the lower border of teres major muscle. It crossed the main trunk of the brachial artery and median nerve superficially from to medial to lateral direction at arm immediately after its origin. It was tortuous throughout its course lying superficially across the cubital fossa. It passed deep to the bicipital aponeurosis and passed downward superficial to pronator teres muscle. It ran along medial side of brachioradialis muscle and was well visible distally. The rest of the right radial artery had a normal course. The right brachial artery divided into larger ulnar and smaller common interosseous arteries within cubital fossa. The ulnar and common interosseous arteries had a normal course( Figure 1 and 2). We found a unilaterally variant radial artery with high origin and superficial course. Variation of the radial artery has been regarded as the most common arterial variation in upper limb . Our case is a typical example of the radial artery of high origin as these cases usually cross the median nerve superficially and cross the cubital fossa posterior to bicipital aponeurosis [1-3,7]. The radial artery of high origin usually pursue a normal course in forearm and in our case, we observed the same things too . The unusual things were - the tortuosity of the artery, origin from the medial aspect of brachial artery and crossing of both brachial artery and median nerve immediately after its origin. The high origin and superficial course of radial artery can be explained by developmental theories. Embryo logically, it can be explained as a failure of disappearance or abnormal persistence of some insignificant embryonic vessels which may give rise to this kind of vascular anomalies [15-17].The variant arterial system is formed due to the unusual persistence of some embryonic superficial arteries in the upper limb( Figure 3). Like any other part of the body, the limb arteries are derived from the primitive dorsal aorta and reach the upper limb bud in the form of capillary plexus. During the maturation and differentiation of the capillary plexus, arteries are formed in following way. 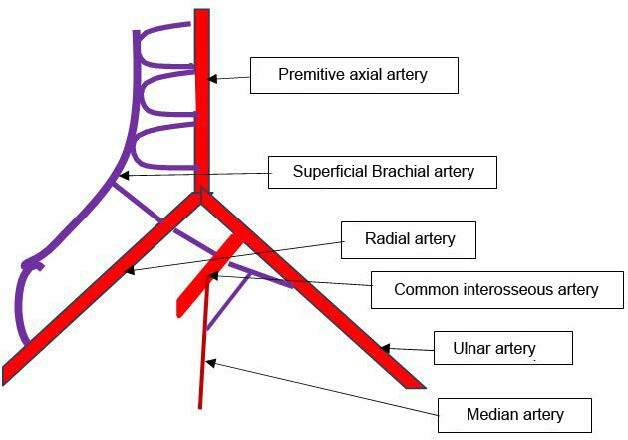 First of all, the primitive axial artery is formed which would give rise to the axillary, brachial, interosseous, radial and ulnar arteries [3,16]. Sometimes, superficial brachial artery (7.7% cases) or brachio-radial artery (14% cases) is formed along with the primitive axial artery . It may lie parallel to and communicate with the primitive axial artery by multiple parallel arterial channels( Figure 4). On its terminal part, this superficial brachial artery joins with the radial and ulnar arterial branches originating from the primitive axial artery and forms the definitive radial and ulnar arteries . In most of the cases, the whole proximal part of the superficial brachial artery and its multiple communications with axillary and brachial artery disappear and only the distal contributions to radial and ulnar artery persist. Sometimes, the proximal part of superficial brachial artery fails to disappear and persist as high origin radial or ulnar artery in the human body. As the radial artery in our case had a superficial and tortuous course over arm and cubital fossa, it could be falsely regarded as a vein during venipuncture resulting in uncontrolled bleeding or painful hematoma . If drug is injected it may cause severe spasm/burning, allergies or another catastrophe. Its superficial location may result in severe bleeding following a superficial cut . During an orthopedic or plastic surgical procedure, if not handled properly, it may hamper the arterial supply of distal upper limb creating a medico legal issue. It may even result in faulty diagnosis (as a case of phlebitis), treatment and outcome [19,20]. Radial arterial variation may cause misinterpretation of upper limb arteriogram images . Radial artery is being used in different interventional and diagnostic radiological procedures including coronary angiography, percutaneous coronary interventions and coronary artery bypass surgery . Coronary angiography via trans radial approach is favored by many radiologists because of lesser complication and early recovery [3,12,22]. Some researchers believe that variation of radial artery may lead to failure of a coronary angiographic procedure via radial approach although success rate could be higher if some technical issues could be kept in mind [14,22-24]. Another opinion is variations of the radial artery, which are well documented already, cannot be regarded as a limitation of coronary angiography via radial approach . As the superficial radial artery in our case crossed the median nerve superficially, it may cause radiculopathy or peripheral neuropathy like features in persons having such variation. The main limitation of our study is that the dissected structures are not very clear as the cadaver was dissected by first- semester medical students as per their routine assignment; although the origin and course of radial artery are well visible. The possibility of this kind of radial arterial variation should be kept in mind by plastic and orthopedic surgeons, interventional radiologists and even by paramedical technicians to avoid complications. We found a case where radial artery took its origin from the medial side of upper part of brachial artery in the arm and crossed the brachial artery and median nerve immediately after its origin superficially from medial to lateral direction. The high origin, tortuous and superficial course of radial artery is clinically significant and should be kept in mind by healthcare providers.